I wrote a piece about the Partition of India and Pakistan in 1947 a few years ago. I wrote this after talking to friends and family about the terrible events of that time. I researched by watching documentaries and interviewing people who had experienced the Partition i.e. older relatives and friends, in their late 80s, of different faiths who were living in the Indian subcontinent. I read up on the Partition and watched Hindi and Punjabi films associated with the subject. It took me a good 4-5 months to gather information before I started writing. With all those ideas in mind, I decided to write a concrete poem. In my poem, I used three different voices to make it more effective: the narrator, the detached onlooker and one of the victims. I wanted to make an impact on the reader and listener of the poem. The break down the middle of poem is intentional as it represents the Partition line (new border) and the breakdown of society. In August 2017, I was invited to perform my poetry at ‘UNTOLD – The 70th Anniversary of the Partition of India exhibitions’ organised by Komlaish Achall, local artist and photographer. As there were three voices, three people read Partition of a Homeland. It was well received by the audience. As a disabled woman writer, I quickly discovered that if I had lived during that time, it would have been highly unlikely that I would have survived the experience. Women in general were not educated in villages and towns so they lacked awareness of the world and politics. Indian culture was very negative towards women and disabled people. In the eyes of community, for example, being abused sexually, raped or losing their husband would lead to shame and dishonour. Usually women ended their own lives as a result to protect the family name. 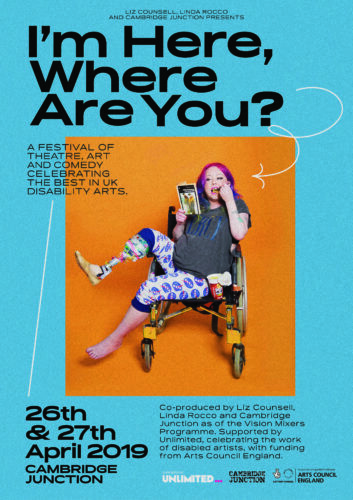 Being disabled would be considered as being a double disgrace, unless they were highly educated, rich, had social status or connections with ‘the right people’. My research shows that many disabled people were killed at birth or marginalised, basically waiting to die. Their lives had no value and were looked upon as a nuisance and a burden. Over the summer of 2017, the 70th anniversary of Partition, I watched the movie The Viceroy’s House directed and produced by Gurinder Chadha and her documentary India’s Partition – The Forgotten Story. I also saw television programmes including Anita Rani’s BBC series My Family, Partition and Me: India 1947. I watched in horror as I did not know half the stories of what went on in the affected areas during Partition. I had thought that religious conflicts caused the country to be divided and it was the fault of the people who lived in India, the Hindus, Muslims and Sikhs, who didn’t get along together. However, hearing the stories of our elders contradicted this conclusion. And Chadha’s programme made it clear that the British led a deliberate policy of divide and rule, fanning the flames of the growing divisions between religion and caste. I was shocked to realise from the documentary that when the idea of Pakistan was first mooted, it was actually regarded by many in authority as a nonsense. Mohinder Singh, my father-in-law was a twelve year old boy in 1947 and lived in Kot Pindidas, a village near Lahore (present-day Pakistan). Before this date, he remembers everyone living in harmony and respecting one another’s religion and living happily together. He said that they didn’t marry into each other’s religions but they had an understanding and mutual respect of the cultures and beliefs in the villages. He told us a story about his blind grandfather who was driven to safety during the Partition. Uttam Singh, his Grandfather, was a retired army Second Lieutenant and had fought in the World War 1. After a full service in the British Army – Regiment of Artillery (India) – he lost his sight. He was intelligent and physically a heavily-built man. Everyone in the village respected him and he could speak English fluently with British army colleagues and friends. He was 97 years old at Partition and when his family members realised how difficult it would be to manoeuvre him, they planned to dispose of him somehow. The monsoon rains would not subside and the rivers were flooding and there was no way that he would survive the ordeal. There were no wheelchairs. They would have used a cart pulled by an animal or person – a wooden platform on wheels for someone elderly and blind. However, his luck was in because he was taken away with his family by jeep by a high ranked relative in the military who came to their village just before mobs were planning an attack. Gangs of Muslims were wandering around the newly created Pakistan with knives and weapons, going village to village, brutally killing the Sikhs and Hindus to drive them out of ‘their country’. Meanwhile the Muslims were being driven out of India, some viciously killed by the Sikhs. Uttam Singh and his extended family crossed the new border and entered safely in India, settling in an abandoned predominantly Muslim village called Pandori Rajputan. He lived another seven years after the Partition.This is one story of survival, but for many people it was not that easy. During this time there were many contemporary writers and artists. Some lost all hope but for many it was a chance to raise their voices and tell the untold stories of that time. Some lost their voices, one of whom was Kazi Nazrul Islam, a Bengali poet, writer, musician and revolutionary and now the national poet of Bangladesh. The Partition had a profound impact on his life. He was so devastated that he never spoke or wrote anything after 1947. Writer Khushwant Singh described the events that took place in Train To Pakistan, an historical novel, published in 1956. He recounted the Partition as it happened. Bapsi Sidhwa, an award winning Pakistani novelist, worked above all to bring women’s issues of the Indian subcontinent into public discussion. She wrote some vivid novels and screenplays about the Partition and women e.g. The Crow Eaters, Ice-Candy Man and Cracking India. 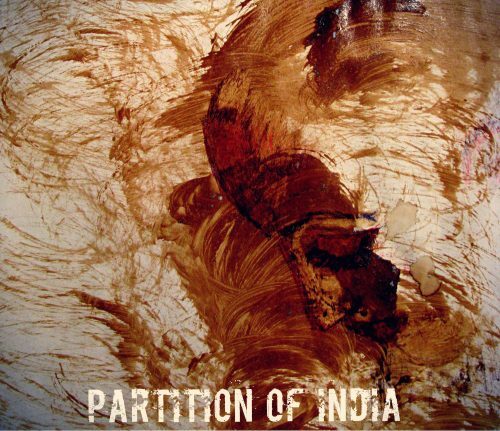 Artists painted their raw feelings on Partition. Sardari Lal Parasher was an artist, writer and philosopher. 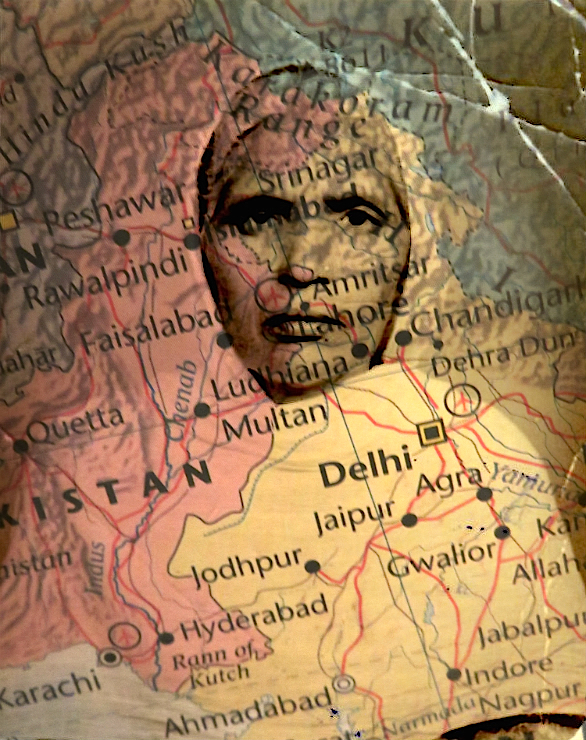 He was 43 years old when Partition cleaved the subcontinent and uprooted thousands. 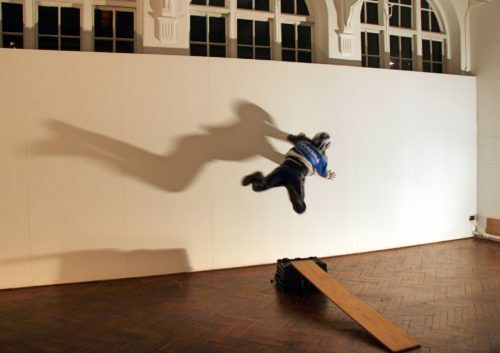 Jimmy Engineer is a Pakistani, multi-layered artist who painted dramatic scenes of the Partition. Great, powerful poem about an era that’s all-too-easily brushed over. This 70th anniversary has brought it into people’s consciousness again as it should be. Thanks for the poem, it is always hard to read about these events so close to home, but we must remember!! I am proud of my mummy. Well done mum! 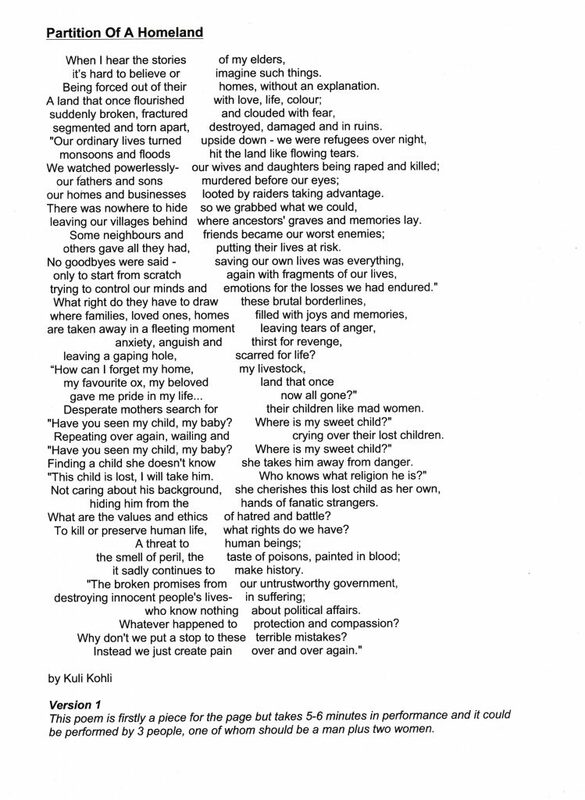 A fantastically well written poem as always by Kuli about the displacement of 15 million people and where at least 2 million people died because of Lord Mountbatten. Keep up the good work Kuli. A superb poem; vividly descriptive and both poignant and heart-rending. Another masterpiece, Kuli, well done! Great piece of work about the division of India. The article captures all sorts of issues that have affected thousands of people of India. Well done! Kuli, you certainly show what an obscenity India’s Partition was, and, as so often happens, religion is conveniently blamed. And somehow there are plenty of bigots who are doomed to relive the painful lessons of history. Like you, I was born in independent Bharat, but have traumatised relatives who fled from both West and East Pakistan, as well as some who died at the time and some who remained and became lost to us. Understandably, ‘Partition’ literature is an important part of Indian literature. Kuli, your poem has added to that vast genre.